Men always have a thing about being “real.” The Los Angeles Raiders used to say, “Real Men Wear Black.” That’s understandable since black is often associated with masculinity. For the past four months, however, I have met more ‘real’ men wearing pink than I ever thought possible. Who are these guys? They are men enough to cry when they talk about a wife they lost. They are men enough to put an arm around a stranger on a 60-mile walk. 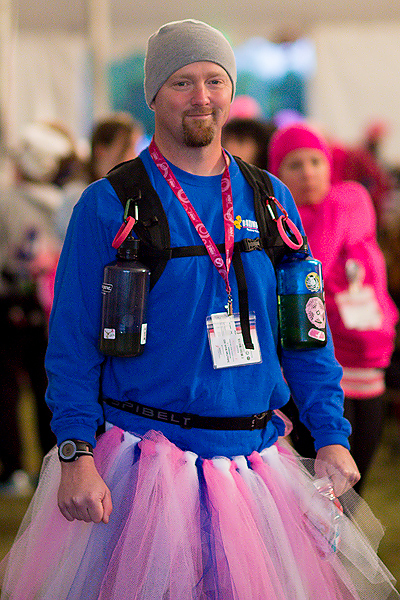 And yes, they are men enough to wear a pink tutu and walk down the streets of Dallas/Fort Worth. That’s a real man for you. 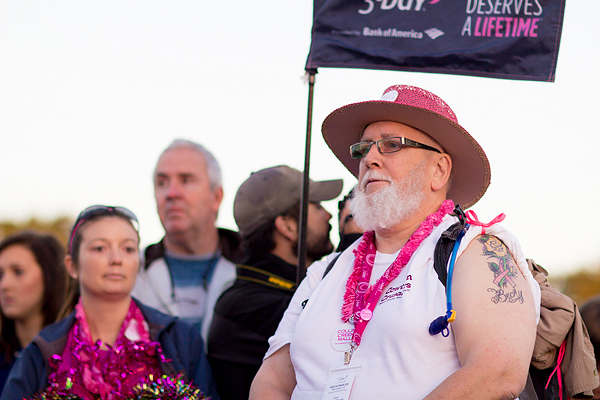 “I don’t mind wearing pink!” said Tom, early on Day 2 before the walk started. 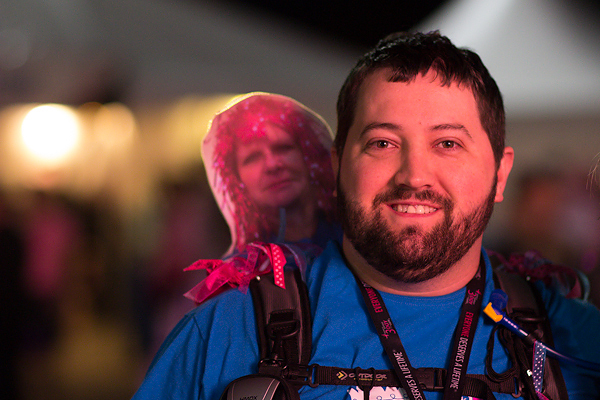 “My wife is a breast cancer survivor, and I have had many other friends who have battled the disease. I teach school and I’ve been wearing pink shoelaces for about a year now.” Tom was asked to carry a flag in honor of his wife in the Opening Ceremony. Frank was dressed in the blue colors of Team Tiara. “They had adopted me into their team!” he explained at the beginning of the route on Day 1. He also toted the cutout of a dear friend and walker who unfortunately was undergoing surgery on Day 1 of the 3-Day even though she had already raised her money to walk. Affectionately dubbed “Flat Janice” the team carried these “flat” cutouts of their teammate to tote her along for the long walk. Frank seemed pretty content with his adopted team. Even Youth Corps enthusiast Eli got involved because of his grandfather. “My grandpa actually died from breast cancer,” said Eli at the lunch stop for the walkers. Eli had to raise $500 and go through a rigorous interview process to be accepted into the Youth Corps, which supports the event. Eli’s youth group is identified by their brilliant yellow shirts, with of course, some excellent pink highlights. 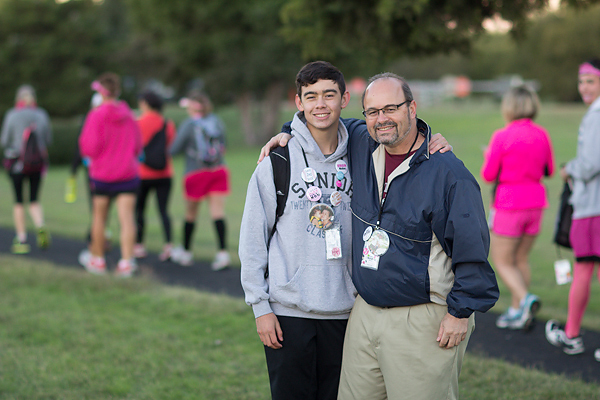 Frankie and son Nathaniel represent all the men who pick up the pink banner and join the hundreds and hundreds of women and men who walk to fight breast cancer this weekend in Dallas/Fort Worth. 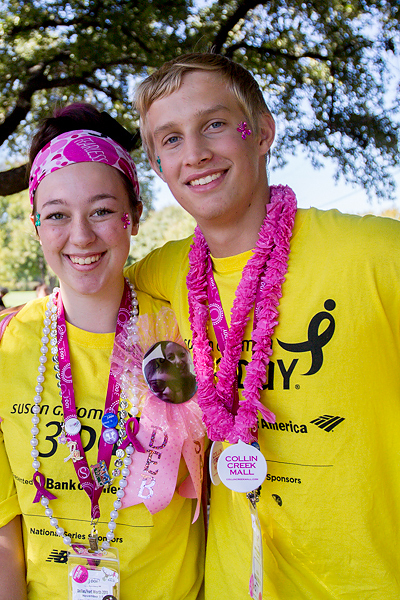 Thank the men in pink this weekend on your Dallas/Fort Worth 3-Day event!